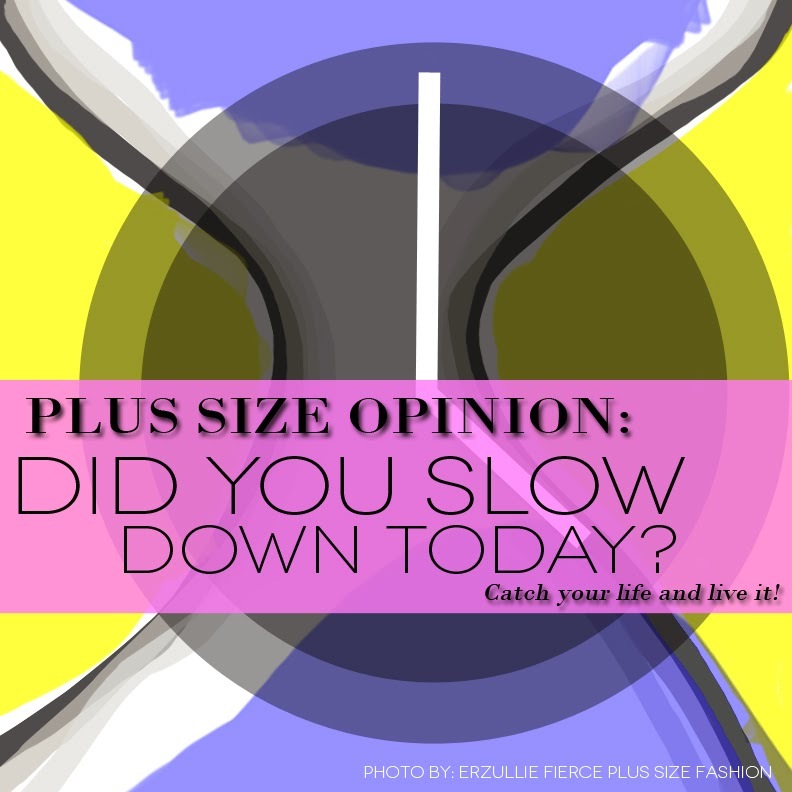 Erzullie Fierce Plus Size Fashion Philippines: PLUS SIZE OPINION: DID YOU SLOW DOWN TODAY? PLUS SIZE OPINION: DID YOU SLOW DOWN TODAY? We can easily get lost with everything in our lives --- love, money, goals, ambitions and we would like to keep up with everything flawlessly to show to everyone how strong we are. We resist to be unmasked for who we are --- human beings who need to connect, not only to the people around us but to what is actually happening to us. So the question is, did you slow down today? I sometimes find myself going about my day. Just doing one thing after another and sometimes several things at once and then at the end of the day, if I ask myself, “what happened?” I can barely recall. To be honest, at first, I didn’t mind. But one day, as I was blogging for Erzullie, I just realized that it was already 9 am (I start at 5 am). The rays of the sun were beautiful and there I was ignoring it as I type away in my laptop. I have wondered at that moment, how much of my life have passed by already? I am so caught up with “keeping up” with everything that ironically, I only kept up with the tasks, but not with my actual life. I miss knowing that I can breathe, that I have my health, that life is not in the work that I do but the moment that I actually felt it. I was too busy catching my dreams, I forgot to wake up from time to time to realize, how amazing reality was. In search of true beauty and a good life, I have realized that I have ignored it. It was in front of me all along and all it takes is us to stop, take time and slow down. Hugs, Erzulliestas. Live every time. Waste it not.